Sullington Warren is a designated site of special scientific interest (SSSI) for its flora and fauna. 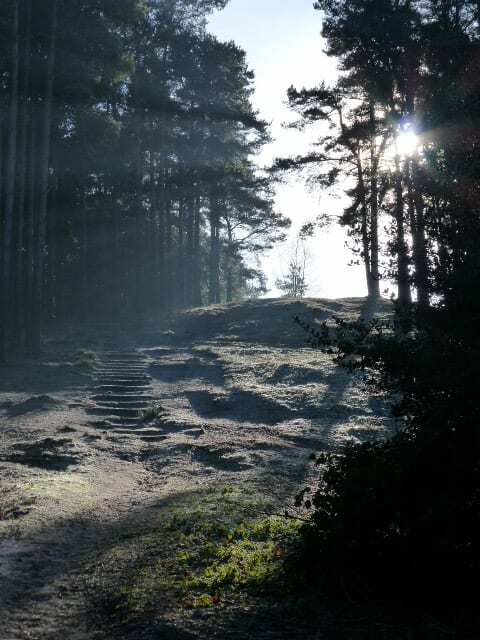 It comprises 60 acres of heathland areas mixed with woodland. The wet and dry heathlands support a wide variation of plants, ranging from the Common Sundew to the Cross-leaved Heathers. Much of the work done by the National Trust at Sullington Warren is focused on maintaining, improving and extending the areas of heathland. As well as clearing scrub, brambles, saplings and bracken this also involves the removal of some trees, mainly Scots pine. The removal of trees is sometimes unpopular but in this instance it is the right thing to do as it is necessary to preserve the heathland and the species that depend upon it. Heathland is an internationally rare habitat and this photograph collection shows that in relatively recent history there were far fewer trees on the Warren and surrounding area than there are now. As well as the heathers and trees here are a number of other plants in the area such as the Hare’s Tail Cotton Grass which is found in the wet heath areas, numerous lichen in the dry heaths and the Field Mouse-ear, a plant of dry grassland and therefore relatively rare throughout Sussex. The trees include Scots Pine, Silver Birch and Pendunculate Oak as well as Hazel with the occasional Ash, Mountain Ash (Rowan), Holly and Alder Buckthorn. Sullington Warren is the only known home of one species of Crane-fly (Nephrotoma sullingtonensis) which is dependant on hot, dry, sandy heathland slopes. Other invertebrates recorded in the area include Mining Bees and Wasps, Tiger Beetles (now rare throughout England and Wales) and Funnel Web Spiders. Other more rare species include the Bog Bush-Cricket and the Mottled Grasshopper. Moths include the Ruby Tiger, Oak Eggar and Emperor – typical heath species. Among the reptiles to be found are the Slow Worm and the Common Lizard, though sadly not so common these days, and Britain’s only venomous snake the Adder, or Viper as it is sometimes called. Visitors are unlikely to see any of the reptiles especially the adder. This shy creature will quickly disappear if it feels the vibrations of footsteps and will quietly slither away to a secluded spot where it will feel safe. However, visitors do need to be aware that adders have been seen basking on footpaths and amongst the heather on the heathland areas. During the early spring as adders are awakening from hibernation they are liable to be more dangerous as they are often too lethargic to scuttle away. 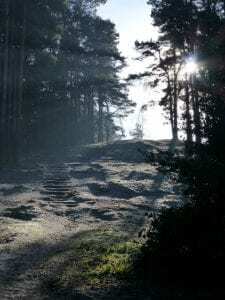 The advice is to stay on the established paths, but keep your eyes open, and avoid letting children and dogs run off the paths into the heathland. A National Trust Local Committee is involved in approving the management plan for the site. As the site is an SSSI the management of the site must meet the approval of Natural England.